So, here it is! Another crazy gig. We shall repeat the Madness again! And this time it only gets better. A bigger bass treat. 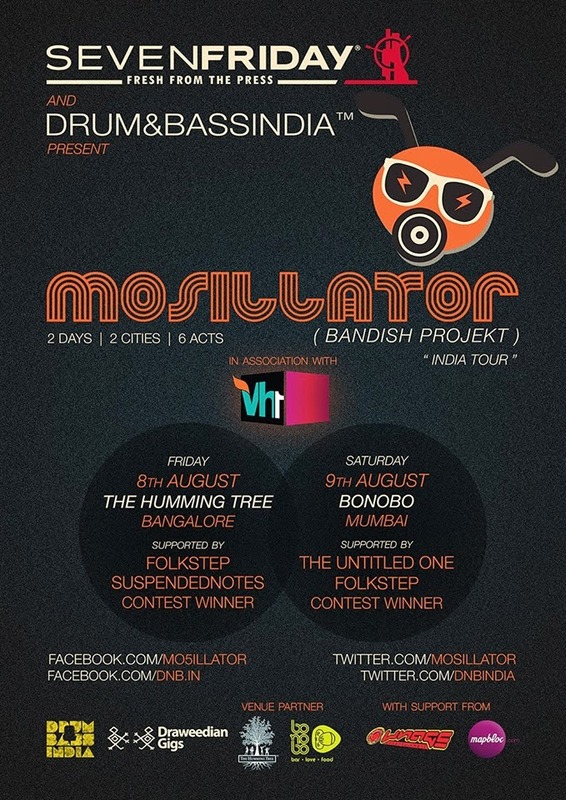 Sevenfriday India and Drum and Bass India™ bring to you, MOSILLATOR, (BANDISH PROJEKT). Mayur Narvekar is the one behind this Bass heavy project. A Composer, Producer, Dj, Remixer, Performer and a multi-instrumentalist. And this is the artist we will be touring with. India Tour. 2 Cities. 2 Venues. 6 Acts. We also have a good news, for all the aspiring DJs. We are going to pick two artists, for each city who will get the opening acts! We will be announcing the Contest tomorrow! Venues : The Humming Tree, Bangalore & Bonobo - Bar.Love.Food., Mumbai. Promotional Partner : Draweedian Gigs. Supported by Ownage Entertainment and Mapbloc.